To cleanse, I use balms morning and night - in summer, I tend to use something lighter in texture for my morning cleanse, but at this time of year I need all of the nourishment I can get so it's balms, balms, balms. I am currently using L'Occitane Divine Cleansing Balm (full review here) and Omorovicza Thermal Cleansing Balm. The L'Occitane balm is extremely hydrating, comforting and soothing on the skin - a real pleasure to use. The Omorovicza balm breaks down every last scrap of makeup, sebum sunscreen etc and thoroughly cleanses the skin without stripping it - all Omorovicza products are extremely gentle on the skin, yet very effective. A little goes a long way with both of these balms, which is a real bonus too. I know some people wince at the price of the Omorovicza cleansing balm, but if you are thinking of buying it, you can get the Moor Mud Set for the same price as the cleanser alone, but it has a value of £90 as there is a deluxe sample size of their Deep Cleansing Mask and Refining Facial Polisher in there, as well as a Cleansing Mitt. If I am wearing a full face of makeup, I use Dermalogica Precleanse first because it will remove even the most stubborn of all makeup without stinging my sensitive eyes. Right now, I am skipping using acids on a daily basis as I found that my skin was over-exfoliated for a while, which led to it being even more dry and rough. Instead, I am using either Colossol Water Milk or Earth's Recipe Energy Boosting Toner. I spoke about the Colossol product here and I really don't know how it works but it leaves my skin so soft. I swipe it all over my face using a cotton pad and it doesn't leave any residue or tacky feeling. The Earth's Recipe toner has the texture of an essence - (lighter than a serum but not watery either) and again, I apply that with a cotton pad. It feels very soothing on the skin and it also hydrates my skin. I tend to use this at night and the Colossol product in the morning and the overall result is soft, hydrated skin. I have two mists on rotation at the moment: Omorovicza Queen of Hungary Mist and Earth's Recipe Therapy Mist. I've waxed lyrical about the Queen of Hungary Mist many times before but if you are new to my blog then you need to know that this is a very soothing, refreshing and hydrating mist. The spray is so fine that it can be used to refresh makeup throughout the day, without disturbing it but it is also the perfect post cleanse mist. The Earth's Recipe Mist contains hyaluronic acid to hydrate the skin and cypress extract to sooth the skin - both of which combine to make this the perfect facial mist for the colder months. I have to mention that this is more of a spray than a mist in my opinion because it saturates the skin so it couldn't be used over makeup during the day. Next up, I use Omorovicza Omoressence, which is an essential for me. This product banished all signs of dehydration from my skin within the first few weeks of use. Omorovicza is a brand that has so many game-changing products, this being one of them. I apply this by splashing on my face and then waiting a few minutes before moving on to the next step. It is soothing, hydrating and balancing - an all round wonder product that I will be putting on my Christmas wish list as this bottle is almost empty and although I have another essence in my collection (SK:II Facial Treatment Essence), it isn't as effective as Omoressence. Next up are serums and oils and I have a few on the go as they're my weakness! The non-negotiable night-time product is Estée Lauder Advanced Night Repair. It is simply the best night serum - it soothes, hydrates, plumps, strengthens and repairs the skin and it has been a staple for probably around 9/10 years now. In the morning, the main serum I am using is Erno Laszlo Timeless Skin Serum, which has a gorgeous, silky texture - lightweight and non-greasy. This serum has really helped to improve the texture of my skin as it is much smoother overall, but it also feels stronger, with more elasticity. It contains Vitamin E to fight free-radicals, glycerin to attract moisture and yeast extract to support collagen production. On days where my skin feels extra dry, I use a few drops of Sarah Chapman Skinesis Intense Hydrating Booster - this has a light silky oil/water texture and it instantly quenches my skin's thirst, without leaving it at all greasy. Brand Focus post here. If I am having a no makeup day, I may choose to use an oil, rather than a moisturiser, or sometimes both and my products of choice are: Sarah Chapman Skinesis Morning Facial or Korres Wild Rose Advanced Brightening Facial Oil, which is perfect for this time of year as it really does brighten the skin and add radiance. For eye cream, I am using a sample pot of It Cosmetics Bye Bye Under Eye Eye Cream, that I got with a Sephora order last month. I really like this product because my under eye area is nourished without being greasy and plump but not puffy. It Cosmetics now have a dedicated UK site here. My night moisturiser is Temple Spa Repose, which is an aromatherapy cream - the scent is relaxing but I also how this moisturiser nourishes and soothes my skin. A little goes a long way with it too! In the morning, I am using either It Cosmetics Confidence In A Cream or Earth's Recipe Moisture Bound Cream.To be honest, I am not crazy about either of them - neither is really nourishing enough for my skin so I'm still on the hunt for the perfect moisturiser for my dry skin. I would love to hear any recommendations you might have? 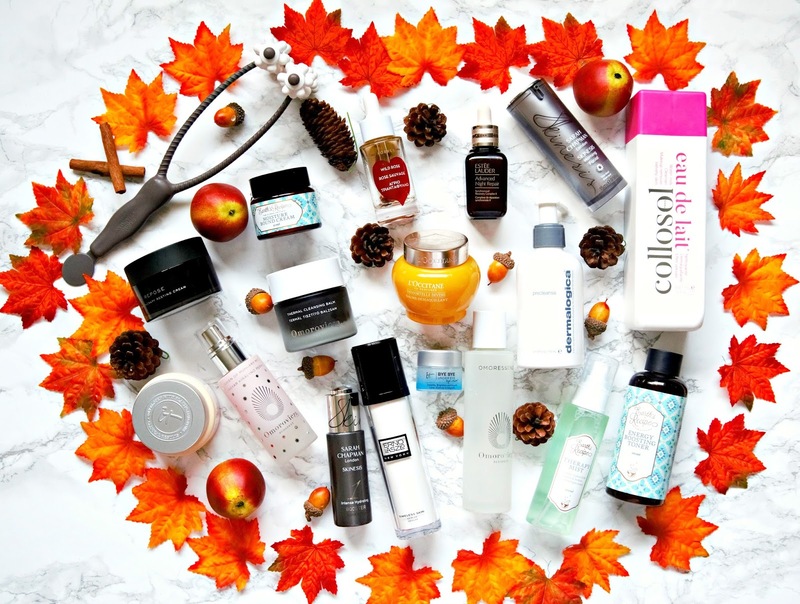 Have you changed up your skincare routine for Autumn? I'd love to hear! All products are bought by me, unless otherwise stated. The Earth's Recipe products, L'Occitane cleanser, Temple Spa moisturiser and Erno Laszlo Serum were sent to me. Opinion is always my own.